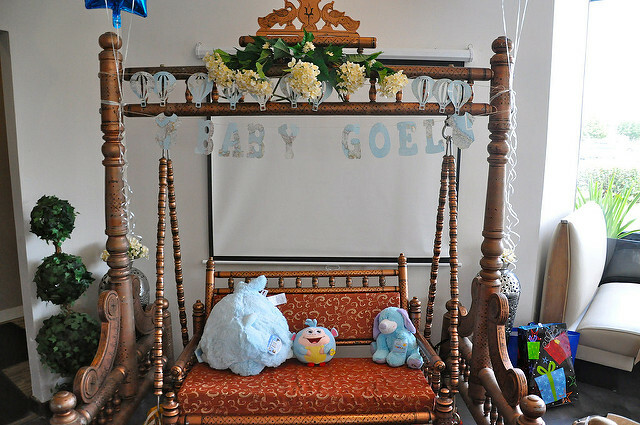 Godh Bharai also known as the Baby shower is an auspicious occasion which is celebrated during the last trimester of pregnancy and is one of the most awaited occasions for the family members. The phrase “Godh Bharai” literally means filling the lap of an expecting mother with abundance. The rationale behind the celebration of a Baby shower is to bless and welcome the unborn baby and to wish the expecting mother with a lot of joy and abundance. When is Godh Bharai Celebrated? This occasion is usually celebrated after the completion of your seventh month when the baby and you are considered to have entered into a safe zone. Some people prefer to have a puja after the baby is born rather than having Godh Bharai in between. However, Godh Bharai is getting increasingly popular and a lot of friends and families are opting to celebrate it to cherish these wonderful memories later. How to Celebrate Godh Bharai? 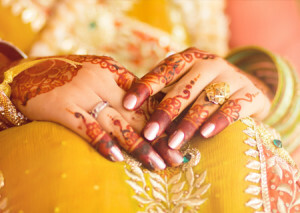 The rituals for this special occasion varies from community to community, however, the logic remains the same which is to bless mom-to-be and shower her with gifts. The moms to be are anointed with oil and are made to wear a beautiful saree. In many communities, the men including the father are not a part of this event. But then times have changed and the dad to be is quite involved in planning. The event is usually planned by close family members or friends. Get few rolls of ribbons or threads of different colours. Each participant is required to cut the length of the ribbon of the same length as would be the size of the mom-to-be’s tummy. The closest match is the winner. 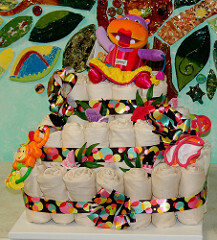 DIAPER CAKE: Make a cake with diapers and place it on the table as decoration. Now the mom-to-be will write down her answers (which possible traits the child should inherit from the father and which possible traits the child should inherit from the mother). Let the guests guess each trait’s resemblance to mom or dad. The answers need to be matched by mom-to-be’s answers and the one with the most matches is the winner. This is going to be a funny game. You will need some sketch pens and square pieces of paper/card (big enough for a forehead). Ask the guests to take a paper and sketch pen each. Keeping the paper on their forehead such that they cannot see it, blindly draw an image of the baby. Most of the time the images come out shapeless, which adds to the humour. The mom-to-be has to decide the winner among the badly drawn images. Keep some wipes ready in case the guests get colour on their face. Hickory Dickory Dock, the _____________ran up the clock (Mouse). Jack and Jill went up the hill ______________________________________. Jack fell down broke his crown and Jill came back ______________________ after. (to fetch a pale of water, tumbling). The wheels on the bus go __________________________________ (round and round). The wipers on the bus go ___________________________________ (Swish, swish, swish). The doors on the bus go____________________________________(open and shut/close). Hot cross buns, hot cross buns ____________________________________ hot cross buns (One a penny, two a penny). The one with the maximum number of right answers is obviously the winner. Another easy-to-arrange game, you’ll just need to buy a few packs of clay (different colors if possible). Give a portion of clay to each of the guests and ask them to make a baby from it. This is a messy and fun game, a sure hit in the party. Again the mom-to-be has to decide the winner. Play some music and let the cushion or a pillow be passed from one to another. Stop the music randomly; whoever is holding the pillow in the hand when the music stops is the loser. The loser is then made to either sing or dance or do some activity of choice. Every guest is required to jot down any best three questions related to mothering a new born that they think a new mom should know. The one with best chosen questions is the winner. After the game, mom-to-be can ask some questions to the experienced mothers to get her concerns answered. What is not safe to be fed to the baby in the first year? Is it required for the new mom to get a regular massage done? What are the precautions to be taken post-delivery? The immediate Do’s and Don’ts for the mothers post-delivery? Which is the best way to lull the baby to sleep? Which are the right postures for breast feeding? Which oil should be used to massage the baby? What should be the diet for a new mom-to-be in the first three months? Which are the foods that enhance lactation? Any other important thing that a mom to a new born should know? Well, frankly the advises and suggestions vary from customs, beliefs and cultures. Some elderly women or your well-meaning relatives would present themselves as experts in these areas while answering. Their beliefs, suggestions and advises may not match yours. So, the wisest way of handling it is to pay attention to everyone but do what you feel like doing for yourself and your baby. Doctors are indeed the best guides and needless to say are most dependable in this matter. 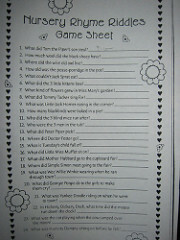 You can choose to omit this game or can modify or change the questions as per your desire. It is only an activity to help you prepare what is coming your way but this activity is useful till when it influences you positively. 1. Give a decorative photo frame to each of your guests and send them the hard copies of the pictures of your Godh Bharai with them in it to put it up on the frames. This will always be a memory to cherish forever. 2. Get some nice dupattas or stoles with some fancy bangles as a return gift. This is something everyone likes to wear. 3. You could choose to give some homemade sweets or pickles or any such thing as a gift. This will give a personalised touch to your gifts. 4. Bath salts and aromas are fantastic gift options for the ladies. 5. Some other return gifts could be aromatic candle sets, nail art kits etc. You could make a combo set of any two or more items also depending on your budget. 6. You could choose to gift them with any decorative house items like beautiful bedsheets, curtains, pots, tablecloth and table mats, cutleries, glass wares etc. Godh Bharai though exciting and fun-filled can be taxing on mom-to-be. You need to make sure that you are dressed lightly. You could go for a traditional attire till when the puja is being performed. After that just slip into something light and manageable. The other thing to keep in mind is to take rest in between because fatigue is not the only thing that you have to be wary about, you may also have swelling in ankles or feet with too much running around. Everyone knows that you are in a pretty delicate condition and hence nobody minds your short episodes of bed rest through the function. Ensure you have a helping hand whenever you do this function. Setting the house up and making all the arrangements is very taxing. Even when you are abroad or in a nuclear setup, just hire some help for a day. You need to plan the arrangements one week in advance. Any kind of mental or physical stress could be harmful to your unborn baby too. Hence, it is advisable that you plan things well in advance and don’t hesitate to ask for help at this stage of pregnancy. If you are a health freak and you want to watch out what you eat even on this special day of Godh Bharai then you need to plan your meals that you would want to serve. A few healthy salad varieties, with few baked dishes, will be great. Avoid fried food and junk food on this day. You could begin with some fresh juices or shakes rather than using the canned ones. And, the desserts could be sugar-free to help you keep a check on your food. This way you end up enjoying your Godh Bharai and remain guilt free forever. If you don’t have much help in organizing your Godh Bharai, a better option is to go for a Pot Luck where each guest comes with a dish. This is extremely convenient and you would not tire yourself out in preparing the food for the guests. One of the most exciting ways of doing it is to put the pictures of mom-to-be’s childhood all over the walls. It makes her feel really overwhelmed and takes her down the memory lane. You could use her favourite toys, books or clothes from her childhood to decorate the place up. You could also involve the nice pictures of the couple and put them all over. You could also think of buying a readymade swing with a backrest. You could get it fixed in your living room and get it decorated with flowers. This could be the place where Godh Bharai ceremony takes place after the puja gets done. It is a great way to enjoy your Godh bharai. 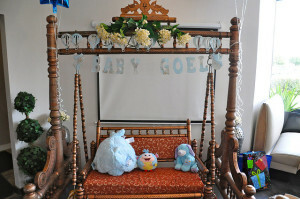 But, the swing chosen should be comfortable for you and you should not choose to sit for long periods on it. The best part about this swing would be that your newborn would love to go off to sleep in this swing and would later love to swing on it once he or she turns into a toddler. Godh Bharai makes you feel very special as a mother. This excitement, warmth and affection in your near and dear ones help you to forget your fears related to the painful delivery that is just nearing. A tip for all moms-to-be is that the entire process of delivery is not so bad as it sounds. You may hear many scary stories of how painful and agonizing the deliveries have been but as a matter of fact, it is not so tough as it sounds. Believe it or not, a right bent of mind with a positive approach gives you enough strength to handle everything that’s coming your way. A positive thinker handles everything positively and hence the pain also reduces due to the secretion of favourable hormones due to positive thinking. So, sit back and enjoy all the attention and pampering that you have been getting. But, make sure to eat right and to add some work out in your daily routine as per the advice of the doctor, to help your body handle the delivery pressure later.